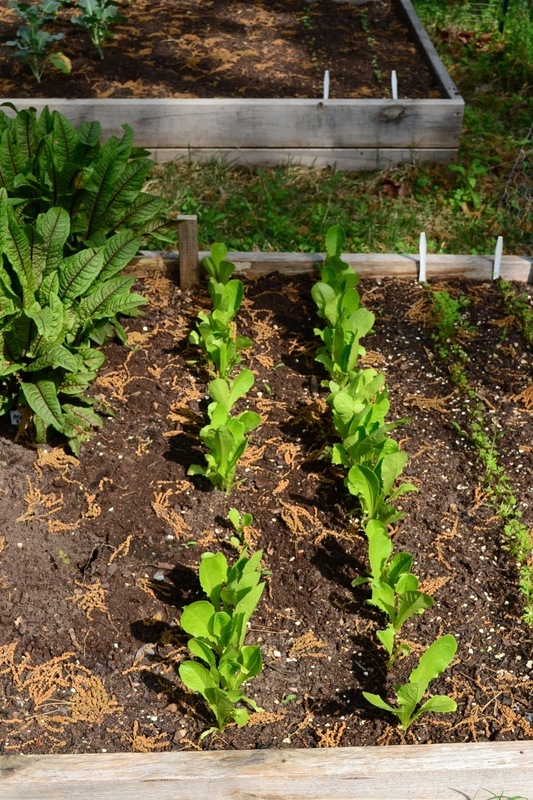 Here it is - a time lapse video of our garden in 18 seconds. The camera was up for just about 1 month, pointed at the vegetable beds. It got jostled a couple of times, so the frame shifts a bit, but not too bad otherwise for a first attempt! The batteries died at the end of the month span, which is why the video isn't longer. I might put it up again later in the summer, or wait for fall. I haven't decided yet. When I do put it back up, I am going to choose a different location, one a little closer to the garden. 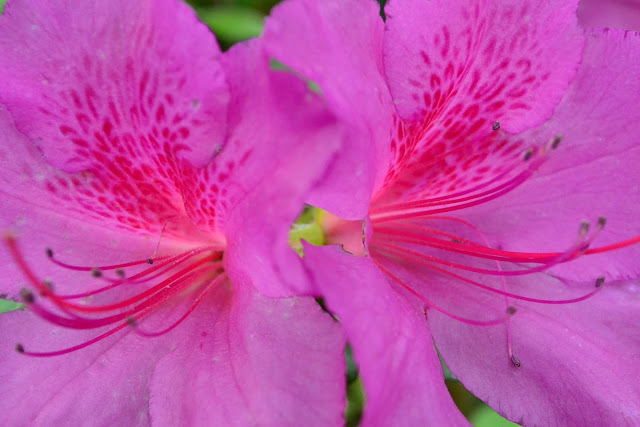 The camera is really made to do close up shots, like a time lapse of a flower opening, so the focus doesn't work as well so far away. And the different lighting conditions every day made the pictures all very different - most of them were taken at 11 or noon (can't remember at the moment which), but have the look of very different times of day. The idea is simple: select a poem you love during National Poetry Month then carry it with you to share with co-workers, family, and friends. You can also share your poem selection on Twitter by using the hashtag #pocketpoem. Need help finding a poem? There are many good resources available online, including the Poetry and Literature page of the Library of Congress, the Scottish Poetry Library, the Poem-a-Day email from Poets.org, and Poetry Archive. I hate to admit how little poetry I have read, for an English major and literature lover, but I do have my favorites, including William Butler Yeats, D. H. Lawrence, Liz Lochhead, Norman MacCaig, Seamus Heaney, Dorothy Parker, Nizar Qabbani, and Billy Collins. 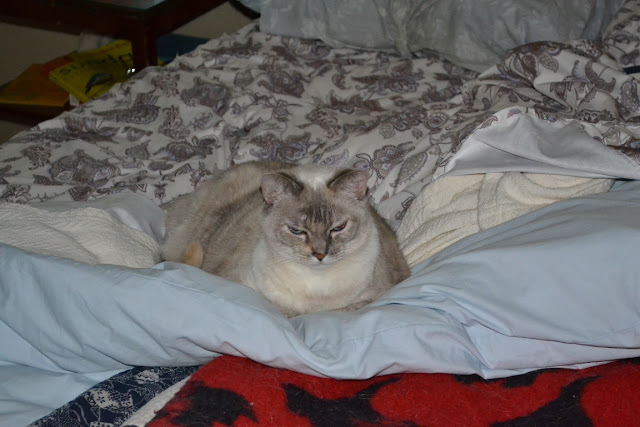 Here, Cleo shows her displeasure at being asked to move from her throne, er, the bed. We left her alone, and the bed did not get made that day. Did you know that silly cat pictures, often with captions, predate the internet by over 100 years? It's true. Victorian photographers did it. Yup, as the post title says, I got nothing. I spent Friday and Saturday at a tennis tournament, and Sunday doing things around the house. I have some pictures on the camera, but the battery died last night, so I couldn't get them off until it recharged. Last week, I started to work on the time lapse video, and it is mostly done, but I have to figure out how to get it into a format I can put up here, and I haven't done that yet. And to top it all off, I think I am entering the "gaining weight, losing my mind" phase of pregnancy. Random emotional breakdowns seem to be par for the course at this point. So far, Benjamin is holding up well - he says it isn't any worse than when I was in graduate school or unemployed, but I find it more annoying now than I did then. Anyway, hopefully I will have something more interesting to say later in the week. 33 years old, 24 weeks pregnant. Fine, you people want a picture of my expanding belly? Here you go. 24 weeks down, 16 or fewer to go. Pardon the messy hair - I had Benjamin take this before I was fully ready to leave for work. You might get another one next month, if you behave, and if I feel like it. 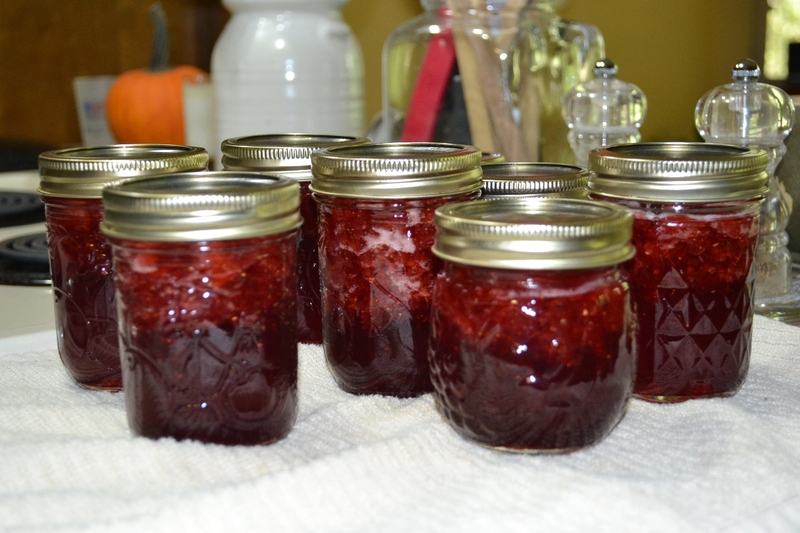 And here is the strawberry jam/jelly I made over the weekend. As you can probably see, all the berry parts seem to have floated to the top. I think I mashed a little too vigorously, so there was more juice than there should have been, which made jelly instead of jam. Oh well. I am sure it will still taste delicious on pancakes, waffles and toast. 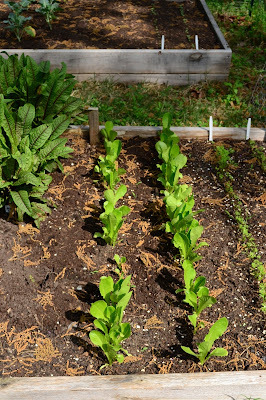 Here is a picture of the romaine lettuce in our garden for your Monday morning. It is actually bigger now, since as usual I am a week or two behind in posting my pictures. I have been harvesting individual leaves for out salads, mixing them in with other lettuces from the farmer's market, and it is wonderful. I love having fresh salad in my backyard. The plant in the upper left corner is bloody sorrel, or ruminex sanguineous. 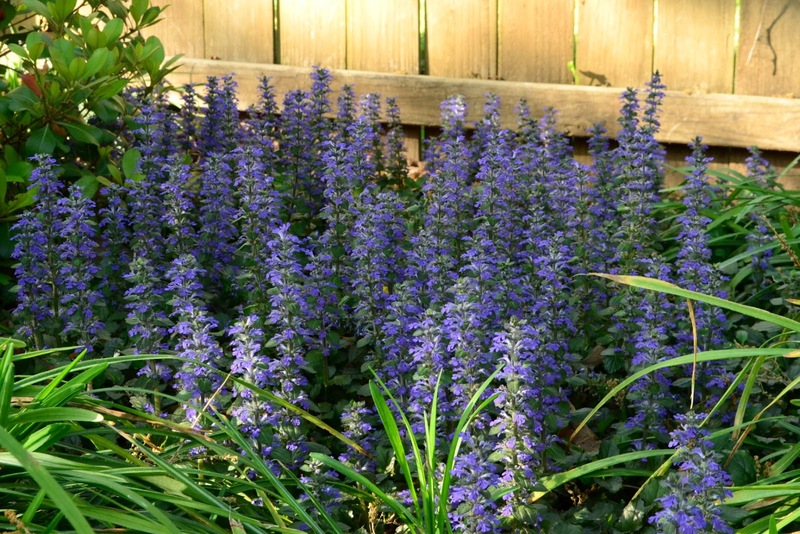 It is mostly used as a decorative plant, I guess, but I bought it as an edible, and put a few leaves in salads to add a bit of variety. Sunday was my birthday, and it was pretty darn good. I made strawberry jam, played some tennis with Benjamin, had dinner with friends, and was not hit by any tornadoes. All good omens for this coming year! 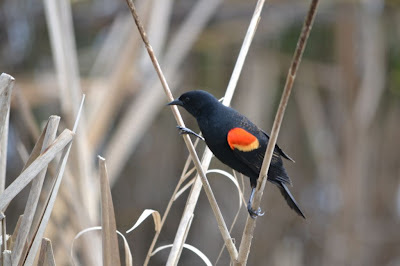 Red-winged blackbirds are one of the few birds I can identify by sound, and be 100% sure I am right. 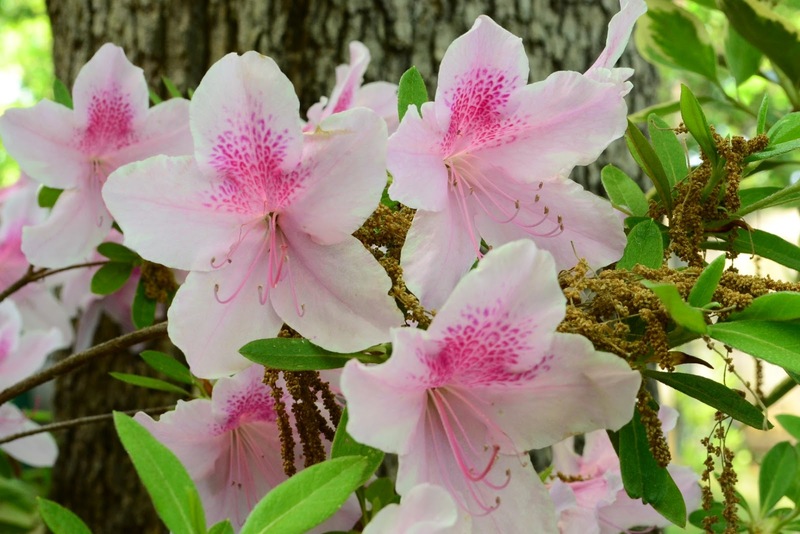 We have a lot of them around the city parks here in Maumelle, and I love to hear them. Here is a picture my mother took in Bellevue the other day. Check out the Cornell Lab of Ornithology for more information and recordings of their songs. This picture creates cognitive dissonance for me. 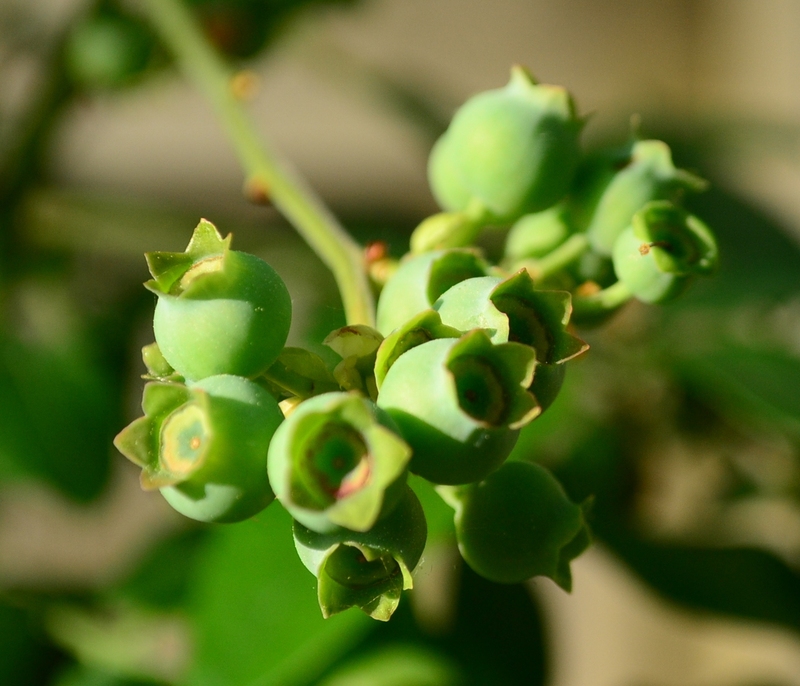 I love blueberries, and am wildly happy that our two bushes made it through the summer and winter and have many green berries on them. But, in my mind, blueberries don't show up until August, during Seafair, when the Blue Angels are flying overhead while we pick them. Here it is, only the first week of April (or it was when I took this picture), and there they are. Based on the patterns of my childhood, the summer goes something like this: June - strawberries (we picked about 60 pounds of strawberries the day before our wedding) and edible peapods, July - raspberries (as a small child, I once completely ruined an entire flat that my dad had spent an hour picking when I tromped through it by mistake, and I've never been allowed to forget it), August - blueberries, blackberries and tomatoes, September - peaches and apples. Not so in Arkansas, or Texas, where I first had to learn to live with a totally different growing season. In Arkansas and Texas, strawberries show up in April, generally a little before or on my birthday. This makes it really hard to have fresh strawberries for strawberry shortcake on the Fourth of July! Not only are they early, they are delicate and short-lasting, since they prefer the cooler, damper warmth of the Pacific Northwest to the hot, dry spring and summer of the south. I doubt I could go anywhere around here and pick 60 pounds of strawberries without breaking the bank. On the plus side, I will be able to make strawberry jam this weekend for my birthday, thanks to the flat I have ordered from my on-line farmer's market. Anyway, cognitive dissonance aside, the task for now is getting bird netting over the blueberries, so we don't lose them all to the thieving blue jays again this year. I promised flower pictures from my garden, and here they are. Spring is in full flower right now, and it is lovely. We had some too warm weather last week, but this week has been perfect, so hopefully the flowers will all last a while. 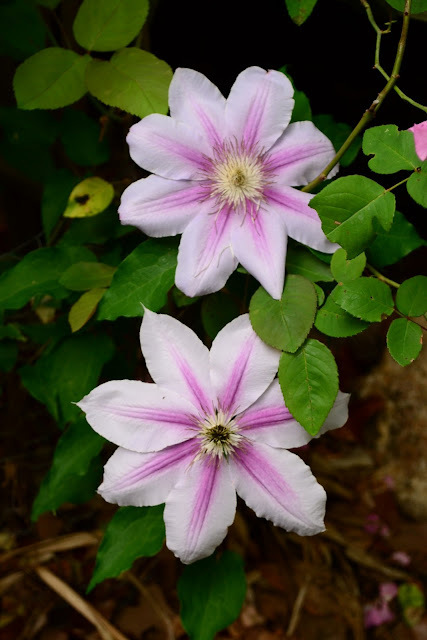 This clematis is pretty darn hardy. 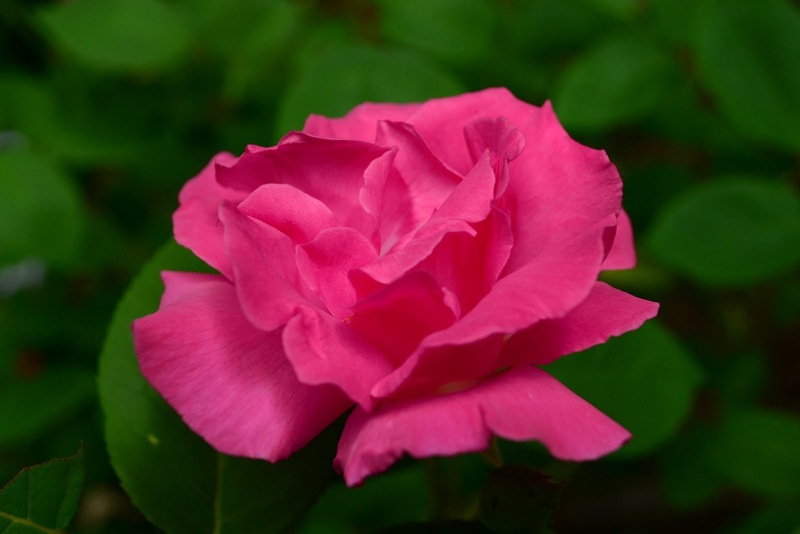 That first spring we were in the house, I chopped it down and planted a rose in its place - but it still came back. And now I am happy to have it, winding in among the climbing rose (pictures of that at the end). This is so exciting! See that little green nub in that one flower? That is a baby lime! Last year, this tree only bloomed in the middle of the winter, when it was taking shelter from the cold in our living room. There are no pollinating insects in our living room. This year, it did bloom in January, but it kept blooming when we moved it back outside, and it has kept going for a couple of months. 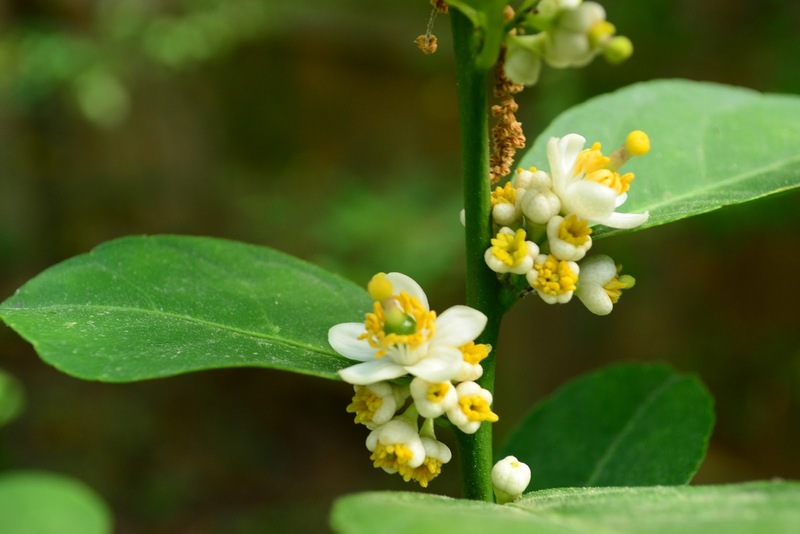 There are a lot of tiny limelets, so we are very hopeful of getting a good crop. One of our azaleas, with added oak tree seed decoration. I don't remember the azaleas doing this well last year, and after the horrible heat and dry of last summer, I wasn't sure they would be in good shape. I was wrong. This one was so bright that all the pictures I took of it look completely over-exposed, even though they are not. It is just that fluorescent. And here is the climbing rose. Last spring, the climbing canes never really filled in, and while we had some roses, there weren't really that many. This year, the bush is much fuller, and there are lots of blossoms. Plus, they smell really nice. 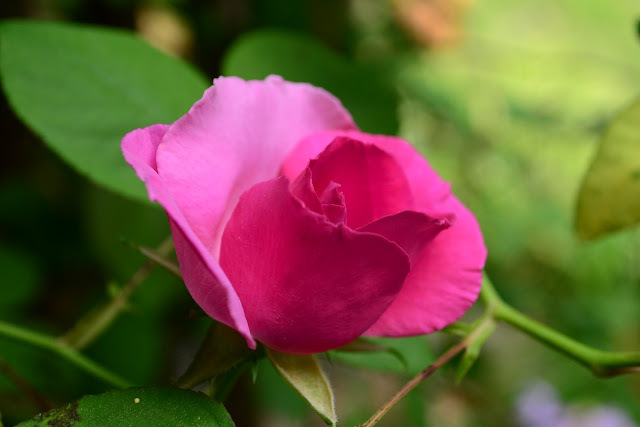 Since I took these pictures last week, the other three rose bushes have started blooming, and the peas in the garden have gotten a few flowers. Next time, I'll give you a few pictures of the edible parts of the garden. This came up twice yesterday, which was a little odd, considering it almost never comes up. One co-worker was amazed that we don't have cable, and while I was taking an online survey for a membership we have, one question asked who our provider was, with the only options being cable, satellite, or no TV at all. We have a TV, but we don't have cable, nor do we have satellite. We can get a few broadcast channels, if we stick the antenna out the window, jiggle it just right and stand on our heads. This doesn't mean we don't watch anything, but it does mean we tend to watch new shows about a year after they start and/or get popular. So, how do we do it? And why? I'll start with the why: Primarily, we don't want to pay upwards of $100 a month for something we watch for less than 2 hours a day (most days less than that). Apart from a few regular TV shows, most of what we watch is hockey or baseball. Our local cable provider does not carry NBCSports (aka Versus) at all, as far as I can tell, and that is one of the main channels for hockey. For satellite, we have to get one of the most expensive packages to get it. Our baseball team is in Seattle, so we would have to pay extra for the special MLB channels anyway to watch the Mariners on a regular basis. If we could get an a la carte option, where we could pick which channels we received, and the ones we wanted were available, we would might go for it. Another reason is that so much of what we watch is available online. Daily Show? Up the day after it airs - and we wouldn't stay up to watch it live in any event. Hockey and baseball are also available online, when you buy a special package. Most TV shows show up on Netflix in one form or another eventually. Which brings us to how we watch TV these days. I don't think we are all that unusual, really. We watch some things free, like the Daily Show. We pay for a Netflix subscription that includes one DVD at a time and unlimited streaming, which covers TV shows and movies. Yes, we have to wait a long time for a season of new shows, since most shows don't release the DVD until the next season is about to start. So, we are a year behind on Game of Thrones, Castle, and Modern Family. We are also really late to Battlestar Galactica, but only because we just never got around to it until recently. In addition to Netflix, we also buy Leverage on iTunes right away, so we can see it as soon as it is shown on TV. In that case, we already owned the first two seasons on DVD, and I knew I would just go out and buy the third, so paying to watch wasn't a big deal. The big things we buy are the NHL and MLB packages. Those are each $100+, but that gets us the entire season, and we can watch almost any game we want. There are two exceptions, the first being our so-called local teams - Texas Rangers, Houston Astros and St. Louis Cardinals in baseball, and Dallas Stars in hockey (but not the St. Louis Blues) - which is only a problem when our teams are playing those teams. The second is more annoying - we can't see any game that is broadcast on a "national" channel, which includes both broadcast and cable. Since we bought the package because we can't get those channels, this seems rather stupid. And it can be a problem, because at least one of the teams we watch, the Pittsburgh Penguins, is pretty good and has a couple of big stars, it gets put on national TV fairly often. We also can't get playoff games for either baseball or hockey, unless they aren't on national TV. When we watch shows and games on the computer, we hook it up to the TV (which is not much bigger than a regular computer monitor anyway), so we aren't hunched over the laptop. I know it wouldn't work for a lot of people, my parents included (they always complain about how small the TV is, and how we don't get any channels! ), but it works for us. Now you know way more than you ever needed or wanted to about our TV habits! I promise a return to pretty pictures next time.